The set 8089 Hoth Wampa Cave was released in July/August of 2010 as part of the LEGO Classic Star Wars line. The set consists of 297 pieces, and includes a Wampa, Luke Skywalker (Hoth), a Skeleton, and Zev Senesca minifigures. Some notable features include a Snowspeeder with a winch and an opening windshield, a snow cave with a full skeleton and spine for the Wampa to feed on, a place to hang Luke from the ceiling like in Episode V: The Empire Strikes Back, and a feature allowing for the release of Luke's Lightsaber. 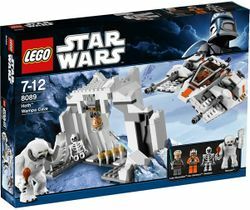 This set adds to the growing number of LEGO Star Wars sets based on the snow planet Hoth, and the battle that took place there, celebrating the 30th anniversary of Episode V.
The set is made up of two main parts; the snow cave and the Rebel Snowspeeder. The Snowspeeder is almost identical in design to the vehicle of the same name released in 2007 in the set 7666 Hoth Rebel Base. It features an opening windshield - with the ability to open the whole thing, or just the front half to allow access to just the pilot - which reveals the interior, able to seat two minifigures, one pilot and one gunner. Every version of the Snowspeeder build in System scale, has been released with a small 2x2 sloping brick with an AT-AT shadow printed on the computer targeting screen. This set includes the same computer as in past sets, but with a slightly tweaked print. Also on the back of the Snowspeeder is the rotating blaster and winch. The winch can be unwound by turning the small TECHNIC gear on the back. The winch is used to trip-up the large AT-AT walkers, allowing you to combine this set and Snowspeeder with 8129 AT-AT Walker to recreate the scene from Episode V.
The snow cave, or "Wampa Cave" as it's officially called by LEGO, is a small brick-built room meant to look similar to the cave in which Luke was taken in the movie. Although being referred to as a "cave", the structure is more just the entrance to the cave than the actual cave itself. On the ceiling under the main entrance is a place to hang Luke. To the right of him, is a mechanism for releasing his Lightsaber, just as he used the Force to retrieve his weapon from the ice. If you push down on the plate above the weapon, it launches the Lightsaber out into the centre of the chamber. Also in the room is a skeleton, presumably some lifeform consumed by the Wampa long ago and a chicken leg. There is also a sort of spine looking-like piece build for the Wampa to chew on, as in The Empire Strikes Back scene. Of the minifigures included in this model, two of them are exclusive, and one of which is only available in one other set. Luke Skywalker was released in what was previously known as "Hoth" gear, otherwise known as his Rebel Pilot suit, since 1999, but was not until this year, released in the actual Hoth gear that he wore on the planet prior to piloting his X-Wing off the planet. He features the 2010 Hoth Rebel Trooper helmet and goggles, previously only seen in the other 2010 set 8083 Rebel Trooper Battle Pack. The Wampa marks the second LEGO Star Wars creature released in recent years, the other being the Tauntaun, from the ice planet Hoth. The Wampa has the ability to hold a minifigure scale chicken leg in its right hand, and an entire minifigure in the other. A feature promoted by LEGO is the ability to pick up the Luke minifigure included in the set. Also included is the rebel pilot, Zev Senesca, who was previously only available in the set 8083 Rebel Trooper Battle Pack, the first time a named minifigure was included in a Battle Pack. There is also a Skeleton from the LEGO Castle theme. This set was briefly seen on a news video before it's official release, which can be viewed here. This set contains a snowspeeder similar to the one in the 7666 Hoth Rebel Base. The set features the first ever Luke Skywalker (Hoth) Minifigure and the Wampa. This is a description taken from LEGO.com. Please do not modify it. (visit this item's product page) Escape from the wampa ice creature with Luke Skywalker™! While on scouting duty on Hoth, Luke Skywalker™ is savagely attacked and captured by a ferocious wampa ice creature. Can he use the Force to recover his lightsaber before the wampa gets him? Or will pilot Zev Snesca™ save him using the snowspeeder? Includes 3 minifigures: wampa ice creature, Luke Skywalker and Zev Senesca! Features wampa cave and snowspeeder! Wampa cave features lightsaber catapult function and skeleton! Snowspeeder includes opening cockpit and realistic tow cable with string and hook! Combine with other Hoth sets from LEGO Star Wars including Echo Base™ 7749, Rebel Trooper™ Battle Pack 8083, and Snowtrooper™ Battle Pack 8084! Wampa cave measures 7” (18cm) long and 4” (10cm) wide! Snowspeeder measures 7” (18cm) long! ↑ 1.0 1.1 This set was briefly available and distributed early through Amazon.fr for a couple of days in May 2010. The set also appeared in Dutch stores in late May 2010. Facts about "8089 Hoth Wampa Cave"
This page was last edited on 9 January 2016, at 22:34.